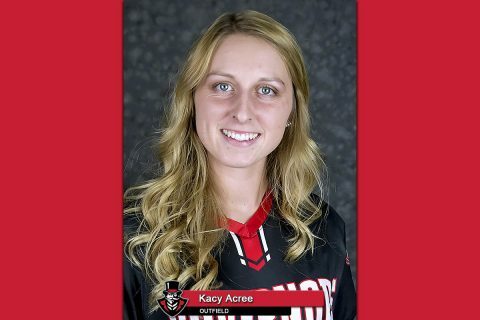 Brentwood, TN – Senior center fielder Kacy Acree earned the first Ohio Valley Conference in-season honor of her career Monday afternoon, being named OVC Softball Player of the Week, as announced by the conference office. The Riverside, CA, native was a force in the leadoff spot in the batting order this past weekend, reaching base in all five games, while batting .533 and recording four multiple-hit games, as the Govs posted a 3-2 mark at the UAB Tournament. Acree ended the tournament with eight hits, including two doubles and a team-best two home runs, while driving in a conference tying 11 runs over the opening weekend. She also scored six runs, drew four walks, posted a 1.067 slugging percentage and a .600 on-base percentage. With her selection, Acree joins teammates Danielle Liermann and Carly Mattson as players on the current roster to have earned OVC Player of the Week honors in their careers. Overall, it is the 18th time that an Austin Peay softball player has won OVC Player of the Week honor.